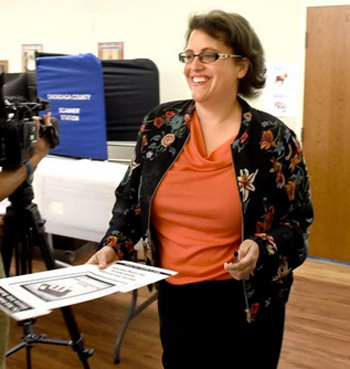 Dana Balter has secured her first union endorsement as she aims to unseat U.S. Rep. John Katko in the 24th Congressional District race. Balter, D-Syracuse, announced Monday that she has been endorsed by 1199SEIU United Healthcare Workers East. The union, which represents more than 400,000 members, is the largest health care workers union in the country. "We believe Dana will fight to make sure that everyone has access to qualify affordable health care, and that our communities have the resources necessary to ensure that working families have the tools they need to grow and excel," said Gabrielle Seay, political director of 1199SEIU. Health care is a major issue in the 24th district race. Balter wants to preserve the Affordable Care Act and shift to a Medicare-for-all system. Katko, R-Camillus, opposes the Affordable Care Act. He supports repealing and replacing the 2010 health care law. Balter has criticized Katko for his support of the Tax Cuts and Jobs Act, the Republicans' tax overhaul that Congress passed last year. The legislation included a provision to repeal the Affordable Care Act's individual mandate penalty. In a statement, Balter said earning 1199SEIU's endorsement is "a tremendous honor." "The members of 1199SEIU dedicate their lives to taking care of others," she continued. "And I know we will be powerful partners in ensuring every person in this country has the health care they need." The union's support follows the announcement last week that the Democratic Congressional Campaign Committee has added Balter to its Red to Blue program. Red to Blue supports Democratic challengers in Republican-held districts. A poll released by Public Policy Polling found Balter leading Katko by four percentage points in the 24th district race. However, Katko is still favored to win the 24th district race. Political forecasters rate the race as "likely Republican." And while Balter has built a grassroots campaign with hundreds of volunteers, the Republican incumbent has more than $1.6 million in the bank.